Given the longstanding antagonism between the United States and Russia, it’s easy to forget that both countries fought on the same side in the two world wars of the 20th Century. And it’s worth revisiting both epic conflicts to see how quickly a short-lived alignment of interests gave way to the default distrust and misunderstanding which has unfortunately characterized the relationship between them ever since. During World War I, admittedly, the two countries weren’t fighting the same fight for long. The United States only joined the anti-German Entente in the spring of 1917, shortly after the prolonged conflict had already helped topple the Romanov dynasty in Russia. Washington welcomed the coalition provisional government that replaced the monarchy, since it made Russia a more fitting ally for Woodrow Wilson’s idealistic war aims—of making the “world safe for democracy”—than the despotic czars had been. But within a few months, the Bolsheviks took power, and withdrew Russia from the conflict altogether, making a separate peace with the Germans. The regime of Vladimir Lenin convened the Communist International in Moscow to plot revolution across the capitalist world. The Wilson administration, which had joined its French and British allies to support the pre-Bolshevik provisional government and its efforts to remain in the war even as the Russian state was dissolving, found itself sponsoring a military intervention into Russia. Its aims were ostensibly linked to the fight against the Germans, but the move was perceived then, and to subsequent generations of Russians, as hostile and counter-revolutionary. The fact that Washington didn’t recognize the new Soviet government until 1933 only served to prolong the bitter aftertaste of the U.S. intervention. The World War II alliance was far more consequential. The Soviet Union and the United States worked together not only to defeat Hitler, but also to design the post-war era. The high point of the Allied crusade may have been the Atlantic Charter of late 1941, which set forth such lofty war aims as respect for borders and freedom from want and fear in the coming postwar order. Those ideals became the basis of the Charter of the United Nations. On a less elevated plane, the Americans and Soviets, together with their British partners, planned the four-power occupations of Germany and Austria, and the joint prosecution of war crimes in Nuremberg. 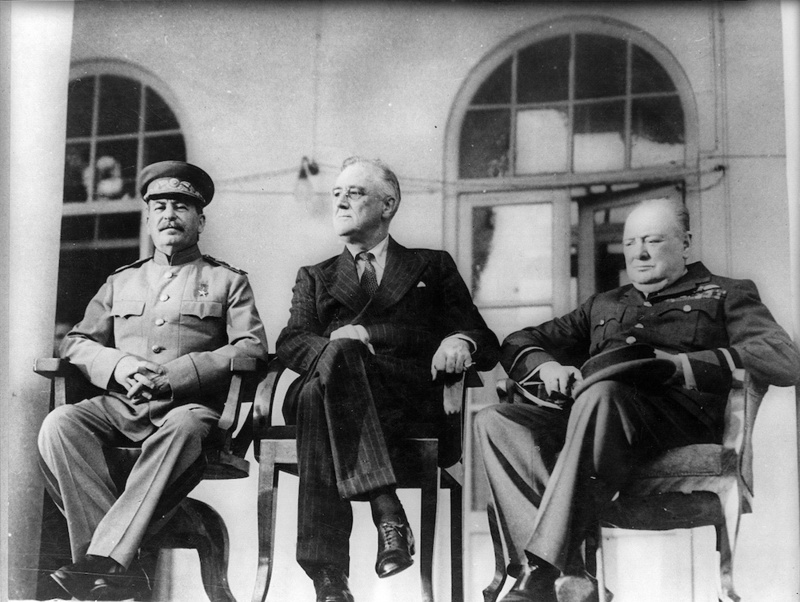 At the 1945 wartime conference in Yalta, President Franklin Roosevelt even tried to make common cause with Stalin against Churchill and the latter’s insistence on defending the British empire. For all its far-reaching accomplishments, the U.S.-Soviet wartime alliance always did seem like a tactical adjustment in both nations’ long-term strategic calculations, rather than a lasting substantive shift. During the war, the Soviets made the lion’s share of sacrifice and did most of the critical fighting that finally led to the Third Reich’s demise, but Americans provided substantial aid to the Soviet effort. The Lend-Lease program delivered to Russia everything from jeeps to the cans of spam that would figure so prominently in the memories of Soviet children from that era. Washington worked hard at fostering a public sense of solidarity with Russia. Similarly in the U.S.S.R the censors and propagandists toned down somewhat their traditional anti-imperialist and anti-capitalist rhetoric to justify their alliance with American and British forces. American movies such as Mission to Moscow were sympathetic to Russia in general and Stalin in particular, depicting a very likable “Uncle Joe” and celebrating the Soviet Union as America’s ally against Germany. Later, many of the filmmakers and writers associated with those films suffered charges of Communist sympathies during the congressional McCarthy hearings after the war, when Washington had reverted to its default mistrust of all things Russian. For all its far-reaching accomplishments, the U.S.-Soviet wartime alliance always did seem like a tactical adjustment in both nations’ long-term strategic calculations, rather than a lasting substantive shift. The Soviets never forgot the American posture towards them at the time of their revolution, and the Americans never forgot that Hitler’s betrayal of Stalin and their perfidious Nonaggression Pact of 1939 was the only reason that this was a joint campaign. And Stalin’s ambitions to control Eastern Europe after displacing its German occupiers was also a source of tension that would inevitably escalate with the Wehrmacht’s retreat. As a result, the alliance was more tactical and rhetorical than operational; the western allies never had a joint command with the Soviets, as they had with each other. During the war, the attitude of Missouri Senator Harry Truman, who’d preside over the Cold War’s early days later on from the White House, exemplified the limits of Moscow’s P.R. makeover in Washington. Truman was quoted as saying the U.S. should let the Nazis and Communists fight each other off, without taking sides. That wasn’t official U.S. policy, but Russian leaders were suspicious of how long it took the Americans and British forces to open a second European front with the D-Day landings. The world never did experience a third world war, thankfully, but there was a final hopeful episode in U.S.-Soviet and then U.S.-Russian relations as the Cold War was winding down with the break-up of the Soviet Union. The administration of George H. W. Bush initially did its best to support the last Soviet leader, Mikhail Gorbachev, and his call for a common European home from the Atlantic to the Urals, Bush dismissed Ukrainian opposition as “Chicken-Kiev nationalism,” and Gorbachev even supported the first Gulf War in the United Nations. But soon America’s resolve not to appear a vindictive “sore winner” gave way to domestic political considerations, and America once again acted in ways that confirmed every last Russian suspicion. Partly as a result of that, the two nations’ hopes for a very different relationship—and Russians’ hopes for a more democratic society, for that matter—have once again ended up in disappointment and a feeling of betrayal on both sides. Mark von Hagen teaches Russian and Eurasian history at Arizona State University, where he is the interim director of the Melikian Center for Russian, Eurasian and East European Studies. This essay is part of a Zócalo Inquiry, The Russian Menace in the American Imagination.